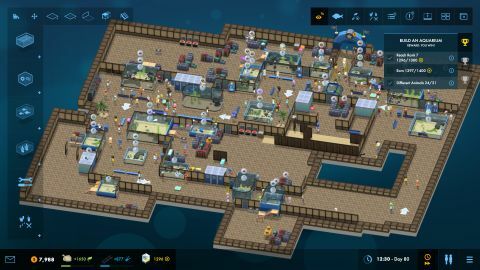 A truly delightful aquarium management game. What is it? A theme park management game with a fishy slant. I have never felt as catered to by a game as I do with Megaquarium, an aquarium theme park management game from the developer of Big Pharma. Right now I’m restarting my current campaign level. This is because, despite being a brilliant fish manager tasked with a new challenge, I maybe kinda forgot to hire any staff to feed the fish and oh God there were so many fishy autopsies. Amongst the fallen (or rather, the floating belly upward) are three schooling bannerfish. You need at least six in a tank at the same time to satisfy their shoaling requirement. Ordinarily I’d just buy three more and pretend none of this ever happened—a strategy familiar to parents of hamster-owning children the world over. But this particular level restricts the availability of some fish, so I can only pick up new bannerfish if the right seller pops up. If that doesn’t happen soon, the remaining three will gradually sicken and die of loneliness. Restarting this campaign level instead of watching this catastrophe unfold is the obvious option (not least because I forgot to create a pre-massacre save file for this level). I restart and instantly hire a team of experts to take care of every watery whim. This time the problem is my striped boxfish. Or rather, all of my big fish which love to snack on striped boxfish. The first one gets gobbled up by a big green moray eel. I forgive the eel but move the boxfish to a new tank to make friends with three humpback snappers. All is well until the snappers enjoy a growth spurt and are the right size to eat their tankmates. This is how I decided to run a boxfish-less aquarium. It was no-one’s fault. Megaquarium is a game of wonderful tinkering. Hours drifted by as I expanded my floorplan, placed new tanks, fiddled with pumps and filters, tweaked temperatures, and generally tried to keep both fish and visitors happy. An abandoned theatre level was a favourite because I slowly managed to transform it from a single auditorium into a circuitous underwater journey, complete with tunnel tanks and daily talks. I’ve spent the majority of my time so far in campaign mode, but as of the full release there’s also a sandbox option where you can curate your own experience by setting variables like starting rank and fish availability. The campaign missions gradually introduce you to the concepts and currencies involved. For example, there’s regular cash which you earn from entrance fees, sales of food and drink, and gift shop bits. But you also accrue Ecology Points and Science Points as the guests enjoy exhibits. These are used to research new species and new tech, respectively. Prestige acts an overall measure of how attractive your aquarium is. Gather enough and you’ll rank up, unlocking more bits for your aquarium. Each creature has specific needs so there’s also a logic puzzle element to tank construction—bullies will harass wimpy fish, and some fish get cross if they aren’t the only one of their species. Starfish won’t take food directly; instead, they need you to be feeding another creature in the tank and the starfish sneaks its nutrition indirectly by scavenging. A few of the systems are a little hard to pick up—it took me until now to realise how to connect multiple tanks to a single pump. That’s important because pumps let you place unsightly tank equipment a short distance away, out of sight of guests. Making them serve multiple tanks means fewer clusters of equipment taking up valuable space. I’ve also not managed to unpick some of the finer points of other tank management systems. For example, fish have a water quality requirement. Filters contribute to a thing called basic water quality and nitrate reactors which you get later in the game help with “higher water quality” but I’m not sure what the difference is or how to manipulate them precisely. As a result I have a few later game tanks where I need to raise the water quality and ended up finding a solution using trial and error. I’d love some menu options to sort fish by different categories, and a few quality of life tweaks wouldn’t go amiss. Not needing to delete a segment of wall manually when I want to place a door to a staff-only area is a big one. Being able to see how big a tank is on the tank info window would help with placing some of the active fish, who have minimum space needs for all that swimming. Cribbing from the recently released Two Point Hospital and using heatmaps to give an overview of the visitor experience would be useful in placing toilets and refreshment stands, too. Oh, and I had to figure out the differences between difficulty settings by booting up the same level in different modes and checking which numbers were different. FYI, as far as I can tell it’s a financial thing—staff cost more to hire and equipment and fish are more expensive. So difficulty is, I think, just about having less of a financial cushion. At that point it would be far more important to know exactly when you need a nitrate reactor instead of a combi filter, but on normal mode there’s more than enough wiggle room. Streamlining the processes to that degree would thus usually be to placate my inner efficiency aficionado (e-FISH-ency a-FISH-ionado). So some of its systems are a little obtuse or would benefit from a bit of post-release tweaking but none of that got in the way of me properly losing myself in Megaquarium’s little world. The building is simple but fun, letting you shape your venue, but ultimately not distracting from the main draw: curating and caring for the fish. The cherry on the fish management cake is that when you zoom in on a level far enough, the camera view switches from top down to actually being in the aquarium. Not only can I create the space, I can a trip through as if I was a visitor, admiring my own handiwork and delighting in my collection of eels.